London, 1938. The effervescent "It girl" of London society since her father was named the ambassador, Kathleen "Kick" Kennedy moves in rarified circles, rubbing satin-covered elbows with some of the 20th century's most powerful figures. Eager to escape the watchful eye of her strict mother, Rose, the antics of her older brothers, Jack and Joe, and the erratic behavior of her sister Rosemary, Kick is ready to strike out on her own and is soon swept off her feet by Billy Hartington, the future Duke of Devonshire. But their love is forbidden, as Kick's devout Catholic family and Billy's staunchly Protestant one would never approve their match. When war breaks like a tidal wave across her world, Billy is ripped from her arms as the Kennedys are forced to return to the States. 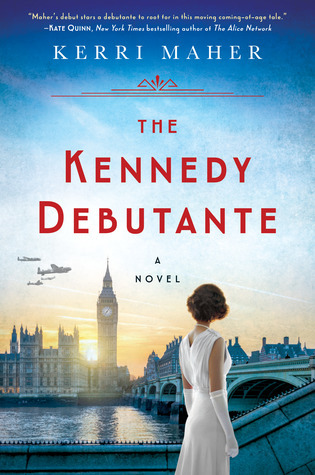 Kick gets work as a journalist and joins the Red Cross to get back to England, where she will have to decide where her true loyalties lie--with family or with love . . . This was such a joy to read. When I opened this up, I wasn't sure what I would find, but what I did find was a great story with wonderful characters. This story follows Kathleen "Kick" Kennedy who is one of the younger children of the Kennedy family. I haven't read anything nor did I know much about Kick so it was really nice to read and get to know her a little bit through this book, even if it was fiction. I loved her dedication to doing the right thing, even if it may be frowned upon, her drive to follow her heart and the realistic way that she tried to balance family, faith and her duty. Getting to know Kick and even seeing her romance with Billy was one of my favorite parts. I felt that this had a pretty good balance of including plot other than the romance. The romance tends to take a focus once things get going. But this felt kind of authentic to life; if your in love and there's a war brewing and you want to spend as much time with your loved one as you can. One thing I love about historical fiction is following the events of the time. I loved that this novel including events that played out over the time period. With the Kennedy's heavily involved in things going on around the world, it felt like a front seat to events that led up to and some happenings of World War II.